Whether it's summer in Colorado or Utah, fall in Montana, winter in Wyoming, or spring in New Mexico -- every season is busy when you live on a ranch. The work is tough, and it's not for just anyone. But it's the work -- and the life -- that cowgirls love best. With respect and a keen eye, Marc Talbert vividly captures the busy days in the lives of four cowgirls: KaDee Chew, Sarah Guenzler, Katy Whitlock, and Leslie Barmann. These young women share abiding love for family teamwork, the animals they care for, and the wide-open, western spaces they each call home. And they all balance the routines of ranch work, schoolwork, and fun with ease. Striking black-and-white images by nationally acclaimed photographer Barbara Van Cleve portray these cowgirls hard at work and hard at play, holding the reins of life with confidence, energy, and joy. Although raised in the Midwest, Marc Talbert spent summers with ranching relatives in Wyoming. The West has continued to influence him and serves as the setting for several of his novels. He now lives in Tesuque near Santa Fe, NM. Grade 5-7-Four girls from Western states are the focus of this glimpse into life on the range and at home. Those who are dreamy eyed about the romance of being a "cowgirl" are in for a reality check. There are no luxuries here; instead there are long hours of hard work and, for one teen, a homemade dress for the prom. 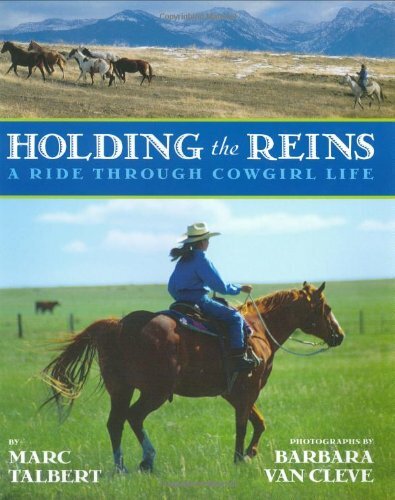 Surrounded by family, community, and the animals they care for, each girl pragmatically describes and participates in the activities that are vital to ranching. Readers who are curious about how sheep and cattle are castrated will have their questions answered in matter-of-fact details. Branding, sheep docking, and inoculations are all carefully explained. From barrel racing to butter making, the young people have lifestyles that many readers will never experience. Although this book clearly describes what they do, it is less successful in creating real interest in who they are, resulting in a somewhat dry presentation. The black-and-white photographs depict many of the activities described, and hints of the girls' personalities show through in some of them. They add a warmth that is sometimes less evident in the text. This look at these unique lives will educate those who have no clue about the realities of ranching.